As a kid in New Jersey, we never did anything so adventurous as cutting our own tree. We’d go to the local firehouse parking lot and try to choose the right one from the pre-cut collection. The standard seemed to be that we should get the fullest and straightest with the fewest bare spots. Then, muttered comments would be made about how expensive they were, and how they could charge so much, just for a tree… So we always got the small-needle prickly type as opposed to the more pricey thick and soft ones. Yanking the Douglas Fir through a funnel-shaped, Tree Tying Enhancer®, the branches were bound with coarse brown twine, and off we’d go down the crunchy frosted pathways of suburbia with our prize precariously perched on top of the car. Another year, in what has to be regarded as an heroic attempt to perfectly emplace the angel on her distant peak, my dad leaned further and further and further from the ladder’s top step. The one that had the yellow and black sticker saying, “THIS IS NOT A STEP!” Just when it seemed like dad might pull off the 9.9 Yuletide maneuver of the year, he lost his balance. Immediately sensing impending disaster, he went, “Ahh.” Then, reflexively snatching the upper part of the trunk with both hands like some kind of primordial ape-man, dad bent the Flexible Fir over in half. Yet somehow, she didn’t break! And thus, however big or small, full or bare, pre-cut or prefabricated in plastic, our Christmas trees are the perennial sign and symbol that in Christ, God will ever be with us. And so in Christ we shall be forever with God. What a beautiful sanctuary! And such nice people! I had done some shots inside back about 7 or 8 months ago. Arriving unannounced, tripod and camera in tow, Mary, one of the administrators, just let me in. Talk about trust. Long story short, Mary let me back in, for as long as I needed to stay (1.5hours!) and what you see posted here is one image from the lot. 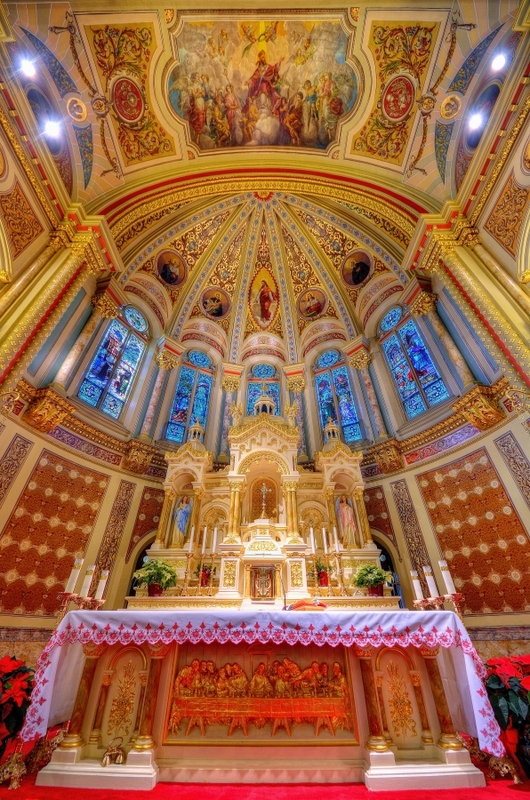 St. Stanislaus in New Haven, Connecticut is an exquisite place to worship God. But, to me, the people working in this church’s behalf are even more special. It’s a privilege having received the grace to cross their path. It’s about 20F degrees as I write this, not taking the wind-chill into account. Some argue that weather isn’t an indicator of climate. Yes, they indeed argue this (unless it’s unusually warm). Eventually, one would think weather would be influenced by climate. Hopefully, the Globe WILL experience some Warming, and come to the rescue of those freezing to death right now. Perhaps we need a few more jet-fume inciting conferences on climate change to help. After all, we’re totally in control, aren’t we? Good thing Julie is here to save the world! I mean, if only he’d been more successful earlier, we’d still have Saddam in power! Yeah! Or, we could have allowed the Taliban more time to saw off more heads, or throw more acid in more young girls faces simply because they have the audacity to want an education. I guess to Assange, they’re the good guys. Honestly, what a cheap megalomaniac. Too bad, some hugely great people, who have really stuck their necks out, will die because of this self-important jerk. You are currently browsing the BillKeane Perceptions blog archives for December, 2010.